Enjoy highlights and listen to ambient recordings from Part I of Telematic Cafe labour-themed discussions! 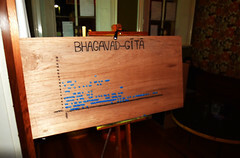 As announced before – this Telematic Cafe event was inspired by VACANTGeelong Project. Telematic Cafe is thankful to the VACANTGeelong Project organisers, especially, Mirjana Lozanovska and Cameron Bishop of Deakin University for collaboration with Telematic Cafe during Open Studio Day, 24 May 2017. 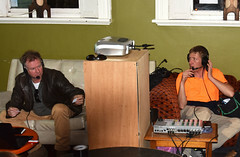 Telematic Cafe would like to extend special thanks to Ian Priddle from Codeacious for responsiveness and time! The “Labour of Making” discussion focused on the significance of manual, constructive and creative production. Discussion partners: VACANTGeelong project artist Robert Mihajlovski (RM) and architect & Senior Lecturer of the School of Architecture and Built Environment at Deakin University Dr David Beynon (DB). Moderator: Telematic Cafe curator Marita Batna. DB: There are similarities between drawing by hand and drawing with a mouse or trackpad. But there is also a difference. There is some kind of distance between you and the object… maybe because you can’t actually touch it. Your hands have been away from it… [physical object] appears through some kind of alchemic process. DB: Meaning of writing comes through syntax and context more than the physical. [..] Maybe it does not matter so much for the reader whether it is actually written by hand or written on a word processor – that makes a difference to the person who is writing. DB: Is there a difference when you are physically constructing a robot and when you got parts? Or, when you are actually doing a design for a robot? I am used, as an architect, to be one step removed from any kind of real construction anyway. RM: By industrial revolution people used to make everything by hand. [..] Today many things are made in an industrial way but through robots. There is less and less skills. [..] In art – in the past – one used to make colours by hand – now everything is going through the factory. Acrylic is made like plastic bags. The past knowledge about how to make [art] materials by hand is nearly forgotten. [..] It is much easier to create but some things are always missing – and that is our creative and spiritual side. DB: I think, in some ways, for people who are traditionally already removed from making things, like architects [..] there is a potential that maybe this will give you more control. [The future] will essentially give a possibility to make a building like you make a model. [..] In some ways you will be less limited then now because it will be you and one medium as opposed to you and a whole series of processes. DB: We are tool making and using species. And if we don’t have a capacity to make tools of some sort whatever the medium is – we lose some of our purpose. People need to feel that they are actually contributing something to the world. And the basic way of doing it is to make something: there is something in the world that wasn’t there before. RM: In the beginning art was made to serve magic and religious purposes. Even today art is a mirror of our social and ideological ideas we have. [..] Art has different branches and targets. [..] Popular art is serving masses – it is more mass media than it was in the past, but still – it’s a mirror of the human condition. The “Labour of Technology” discussion was looking at the role of “post-fordism” in connection with information technologies, communication systems and data. Discussion partners: architect and Senior Lecturer of the School of Architecture and the Built Environment at Deakin University Dr. Mirjana Lozanovska (ML); artist and Lecturer in Art and Performance at Deakin University Dr. Anne Wilson (AW), and Ian Priddle (IP), the founder of Codeacious, a software company based in Geelong. Moderator: Telematic Cafe curator Marita Batna (MB). ML: Post-fordism is often described as this fluid thing of production and consumption. [..] How can you have general public? [..] The question of who is the producer and who is the public is erased theoretically but I would contest that to an extent. 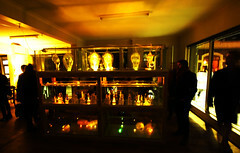 [..] It becomes a transnational way of understanding production but [..] there is still labour production of objects. ML: The idea that the line between production and consumption is blurred – is interesting on one hand. [..] Obviously, when those things are blurred, it is not “products.” [..] So, what is then produced, and what is being consumed? I think those details will become important for us to get into a discussion that is below conventional understanding of contemporary work. [..] One of the things that might be produced is new social networks, new digital networks, new ideas of what, in fact, is social – what is friendship. [..] Our friendships that are manufactured due to kinds of interactions and interfaces that people have in social media – what do these friendships mean? IP: Governments providing data they have and making it freely available is extremely beneficial. [..] If I present to you all the rainfall across entire country and I also say – here is this other set of data – all the traffic lights [..] you might go: “I know how to combine those two things!” to come up with something interesting and useful. IP: I encourage you to go to http://www.data.gov.au/ – you can see huge variety of data that is currently available. Unfortunately, it is not live, they are data sets but you just get ideas by seeking all the things that you could become aware of. IP: In the case of public services [..] – sharing that data is incredible. [..] It is definitely developing. I am glad to say that Geelong has one of the highest number of open data sets for a local council, I think, in Australia. So, Geelong is doing a really good job. There is a shift towards making more data open. Then, the next phase will be making that data more live and more accessible. I think that is an area we need to explore. AW: As I understand that quote [Sean Cubitt claimed that technologies are symbolically inhabited by ancestors and their knowledge but it is invisible to us – MB] our ancestors are inhabiting data through knowledge, through distillation of facts and knowledge that comes through data. [..] Data that is available to us now, in whatever form, has come about through other knowledges and other forms of media in the past. [..] It ended up today as ways of reading information. [..] Pixels and particles are quite different. Particles are in chemical photography and pixels are in digital photography. And that is a different reading of light. [..] One relies upon mathematical formula and one relies upon inherent nature of quantum physics and how light travels. [..] So one appears to be more organic, but one appears to be a distillation down. [..] There is a kind of disconnect, but obviously information is important. [..] I see it as a limitation – that distillation down. ML: If you look at some of the works done here, for example, Sarah Duyshart’s work: she took the sounds of the raw data that were recorded during the workshops with Macedonian community. To take that and feed it into the program that identified just the base sound [..] – it turns this social chatter into [..] a kind of bodily biological life force. [..] I think what Sarah did was primordial and futuristic. IP: We recently did an installation that required VR hardware. We didn’t have VR experience but we could combine this with sound, light and movement to create an experience for people. Because we have focused on understanding those mediums – we knew those boundaries and created art “of sorts” within those boundaries. Because all of this stuff is so new it requires a lot of time and effort and, in particular, digital skills to understand what you can and cannot work with. [..] As technology evolves we will be able to play with it more. ML: What is the possibility of experimentation? The experimentation requires preparatory work of labour in order for it to be a real experiment otherwise it is just immersive pleasure. IP: With the emergence of maker spaces you can join other people who have certain knowledge (these are treated as public spaces) – you can play with different things. Then, people who are interested in that will be able to create, but I guess: will they put in the labour and efforts to go further? AW: In creative practice, I have noticed, technology is the second thing, [..] you have idea and then technology [..] this is how you learn. And this is one way of learning technology. This entry was posted in Communication, Data, Events, Labour, Making, New Events, post-fordism, Technology, Telematic Communication Models. Bookmark the permalink. ← Announcing the next event of Telematic Cafe! My current project as part of a larger Telematic Cafe mobile & online curatorial concept is focused on generating discourse around “labour.” Part I of this edition has taken place and I am offering in this blogspace highlights from these conversations along with ambient recordings. 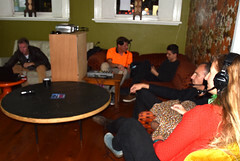 These discussions were held within Open Studio social environment at an old industrial space in North Geelong, Australia during an event looking at memories emplaced in vacant industrial sites.